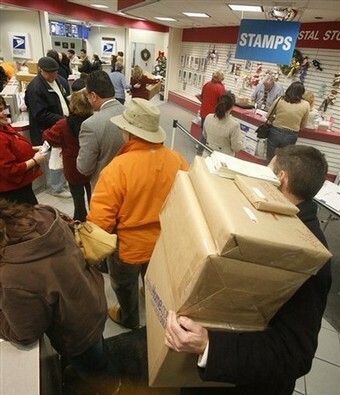 When you create all of your shipping labels online, you get to bypass lines like these at the post office and just drop your packages at the counter. That’s one reason I just spent 20 minutes going through all the forums I’d posted in to find the one with the link to paypal shipping when the customer hasn’t paid through paypal. I’ve been doing some sample freebies, and every now and again, I do have customers who pay by check or money order. I’ve always gone to usps.com to create the shipping labels for these orders. I like shipping through paypal though because it keeps my records all nice and tidy. I try to keep all of my expenses in one place. So this link to paypal shipping when you don’t have an order through paypal is super helpful. Now I won’t have to search forums for it again, since I’ll have it right here on my blog! Thank you glasstasatictreasures for the information! If you are selling your crafts online, whether on eBay, Etsy or anywhere else, you should be reporting your sales to the IRS. The upside of reporting your additional income to the IRS is that you can also write off expenses and as we know, there are many–materials, space in your home that you use specifically for your craft, computer equipment, etc. It’s not the best idea to run your business online and think the IRS will never catch up to you because you’re just a little guy. It was recently announced that Paypal will be required to report payments to the IRS each year, starting in 2011. Paypal is one of the easiest shopping carts to use, and if you are selling on eBay or Etsy, I would be really surprised if you aren’t using it. receive more than 200 payments in a single year. Both requirements must be met for Paypal to be required to report payments. And I would think that this is just the beginning. If you are doing business online, be smart and safe and report your income. And then take the deductions that come along with being in business too!